DeNA has announced the launch of Pirate Bash on iOS and Android devices. Developed in partnership with Kung Fu Factory, the game offers a “full 3D adventure” set on the high seas, as players build a crew and take to battle against other pirates, including other real-world players. In each turn-based battle of Pirate Bash, players’ units are on their ship on the left side of the screen, while enemies stand in strongholds on the right side (think Angry Birds, but with pirates). On their turn, players tap and drag their finger on the screen to form an aiming trajectory for their unit’s current weapon. In the case of an explosive barrel, for instance, players can launch the barrel at enemies and tap on the screen at any time to cause it to explode. Similarly, an arrow can be shot at enemies, and players tap on the screen to split it into two, potentially hitting two enemies with a single shot. A cannon flies and damages items on its own, while an anchor can fly in a curved path before falling straight down to the ground with a tap on the screen. Each pirate on a player’s team comes with its own weapon, strengths and weaknesses, so players are encouraged to recruit new members and try new teams for the best success. Players earn up to three skulls on each stage, depending on their performance. Units earn experience points after battle to become stronger over time, and gamers win keys, coins, gems and others treasures as rewards for playing. These keys can be used to unlock treasure chests, containing new or better gear for pirates, while gems are required in specific quantities to further upgrade pirates. Some gear unlocks special abilities for their associated units, like temporary immunity to damage, the ability to send explosive barrels raining down on enemies, and so on. Players can spend their collected coins on instant upgrades for their units, making them even stronger still. Outside of single-player missions, users can head into player-vs-player multiplayer battles. Here, players earn Reputation Points from duels with others, in the hopes of climbing the in-game leaderboards. In these battles, players must take wind speed and direction into account, which affects a weapon’s flight trajectory. “The fun and easy-to-pickup controls combined with the strategic gameplay and action-packed PvP mode in Pirate Bash brings out the swash buckling captain in every mobile game player,” said Nobuyoshi Fujimori, producer at DeNA. 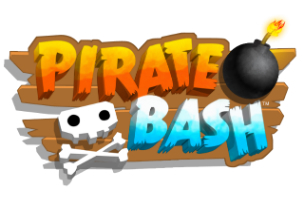 Pirate Bash is available to download for free on iTunes and Google Play. The game is supported via premium currency, which can be used to purchase premium items (like new ships) in the game’s store.